Tonight at the NBA Draft Lottery the New York Knicks had the second best chance to win the number one overall selection. It seemed like the Knicks were set to end up with either Karl-Anthony Towns or Jahlil Okafor in the top two. Then the Knicks had the most Knicks thing possible happen to the Knicks. Knicks. The Knickerbockers fell out of the top three entirely. 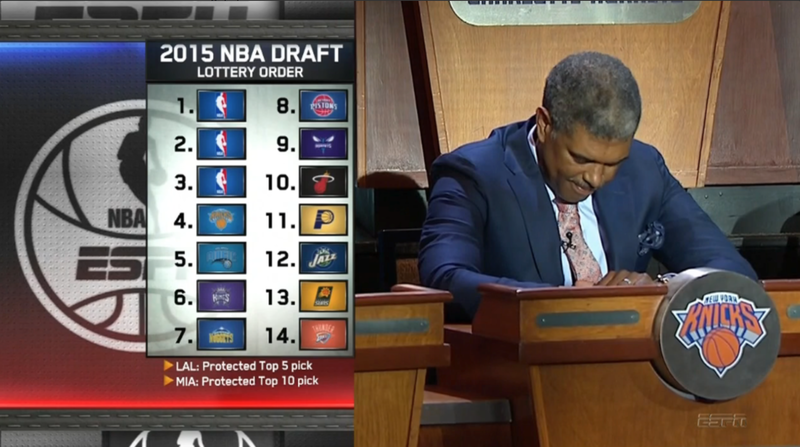 Instead the Timberwolves, Lakers, and Sixers will get their selections before the aforementioned Big Apple team. Every Knick fan I know, including my brother Chase, is a bit less than happy right now. It could be worse. Yeah, you’re right, this is pretty much a nightmare. Sorry Knicks fans.